Ice cream might be my very favorite of all the sweet treats. I could eat it by the half gallon for breakfast, lunch and dinner and never tire of it. It wasn’t until two years ago that I even realized that ice cream did not have to be flavored so simply. We were at L’Espalier Boston and were served mushroom ice cream with one of our delectable chef’s tasting menu dishes. Mushroom ice cream changed my view of ice cream and made me wonder what other types of ice cream I hadn’t tried. 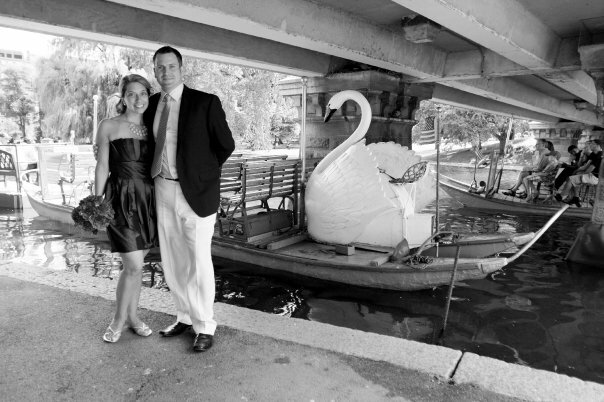 We love to find small specialty shops where we can purchase unusual ingredients. One day we came home with Vanilla Fig Balsamic. We had not used it often, and after another lengthy conversation about food, cooking and recipes we decided to make a vanilla fig balsamic ice cream. As I mentioned earlier I could eat a lot of ice cream if it were put in front of me. This, however, is not that type of ice cream. Much more like the lovely mushroom ice cream we had, this is the type of ice cream that is an accompaniment. The type of ice cream you need one quenelle of. The type of ice cream that is made to enhance the other flavors on your plate. The type of ice cream everyone should try at least once. We began by mixing the cream and milk in a saucepan. That mixture was then brought to a boil. In a bowl we mixed the egg yolks and sugar until the mixture became pale. We tempered the egg mixture with the milk/cream mixture by pouring a ladle-full of the hot liquid into the egg yolks. 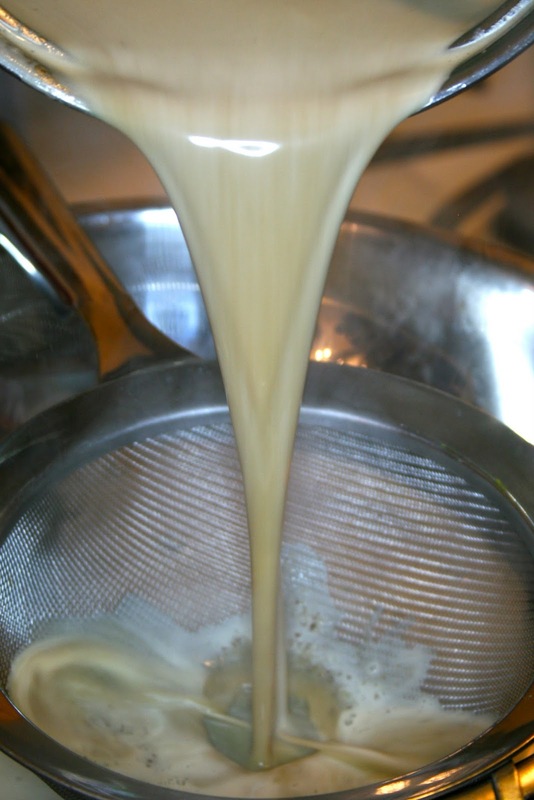 Once tempered, we poured the entire mixture of milk and cream into the sauce pan. We stirred this mixture until it was thick enough to coat the back of a spoon. We then added the balsamic, vanilla bean paste and the corn syrup. It was passed through a sieve and then put in the fridge to cool. 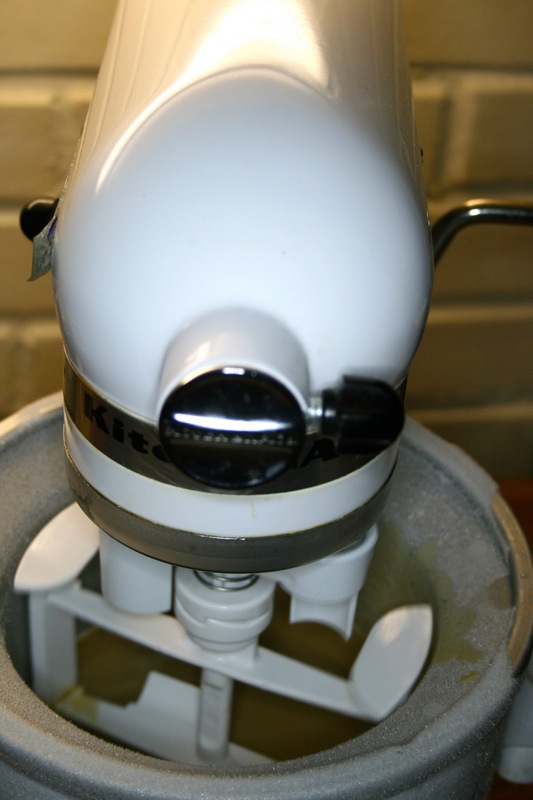 Once it was cool we placed it in our ice cream machine and waited until our liquid mixture turned into ice cream. 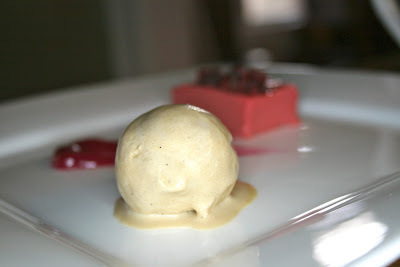 We served our vanilla fig balsamic ice cream with our beet root parfait. I loved how you could see the flecks of vanilla within the mocha colored ice cream.